Jumping in and reviewing The Simpsons in its unprecedented 25th year is undeniably a little daunting. Apart from trying to fill the shoes of the redoubtable Robert David Sullivan, there are a lot of issues that a new reviewer on this beat has to deal with. 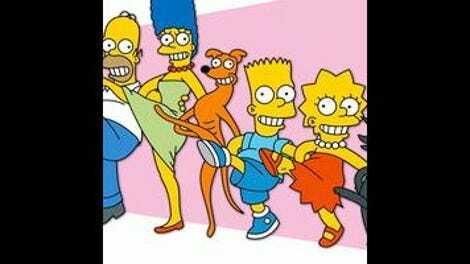 Having been a teenager when the show first began (I may not be young), it cannot be understated, and is gradually being forgotten, just how influential The Simpsons was and, and remains, on American comedy, television, and animation (and me). That’s one side—definitely some daunting going on there. On the other is the fact that, in a universal litany perhaps rivaled only by Saturday Night Live, any mention of the show at this point is met with: "It stinks compared with what it used to be.” Indeed, it’s shocking to me that for younger viewers, that monotonous drone of negativity and condescension is all they’ve ever experienced of The Simpsons in the zeitgeist—it’s like going to a Red Sox game in the '80s and seeing spoiled fans boo because Carl Yastrzemski couldn’t hit like he did when he had those long sideburns. That being said, the sad truth is that late-season Simpsons deserves much (but by no means all) of that dismissive chatter. Each naysayer likes to point out exactly when the show started to lose it (jump the shark, repeat itself, become stale—you pick your cliché), but the only thing everyone seems to agree on is that it definitely happened—and that they don’t watch it anymore. I have to confess that, prior to my getting this gig—and the resulting back-episode catchup binge that that kicked off—I hadn’t sat down to watch a new installment of The Simpsons in years, something that would have been inconceivable for me for the first dozen years of its history. The Simpsons, for a lot of us, simply petered out as appointment viewing. Going into season 25, the question is then—what does The Simpsons still have to offer? Certainly its cast is an astounding asset: Despite the fact that whenever asked about the show Harry Shearer answers like he’s got a gun to his head, the voice talent involved here remains simply astounding. Add to that that everyone involved has a quarter century of insight into these characters, and there’s unprecedented potential for characterization and laughs left. Also, the show’s world, as embodied in its home base of Springfield, is one of the most evocatively detailed, yet malleable, comic settings in TV history. While sister show Futurama could boast the literally infinite storytelling possibilities of science fiction, The Simpsons’ Springfield, bereft of anything more magical than the occasional Loch Ness Monster, provides the show’s writers with a continually resetting comedic template of boundless variety. It’s an Etch-a-Sketch universe where no one ever ages, where anything is possible, and where things are guaranteed to be right where they are when you need them the next time around—a comedy sandbox whose very boundaries themselves define its potential. Of course the chief asset of The Simpsons are the Simpsons themselves. At various times in its history showrunners have proclaimed their intentions “to bring the show back to the family” and the refrain makes sense. For all the trips to space, meteor scares, and impenetrable domes, The Simpsons lives and dies with viewers’ connection to Homer, Marge, Lisa, Bart, and Maggie. Even with 25 years’ worth of various character arcs, interpretations, and occasional drift into mischaracterization, the Simpsons themselves still provide a sturdy, if dysfunctional, emotional core that grounds even the most improbable shenanigans in relatable, even heartwarming reality. Which is good news for season premiere “Homerland,” which continues The Simpsons’ tradition of launching each new season with an attention-grabbing gimmick, but manages to squeeze some genuine heart, and a healthy number of laughs, out of the always-evocative relationship between Lisa and Homer. As you may have guessed from the title, the hook here is a Homeland parody, with Homer returning from an unexpected disappearance (from a convention in sinister Boise) a changed man, and Lisa, ever the lone voice of reason, sussing out that there’s more to her dad’s sudden strange behavior (no pork, no alcohol, a fondness for nuclear plant schematics) than clean living. It’s a stunt, but a relatively well-executed stunt. Because Homer has been brainwashed—by VW busload of hippie-types, inculcating him in the ways of vegetarianism, healthy living, and love for the planet, largely it seems through force-listening of the Grateful Dead. 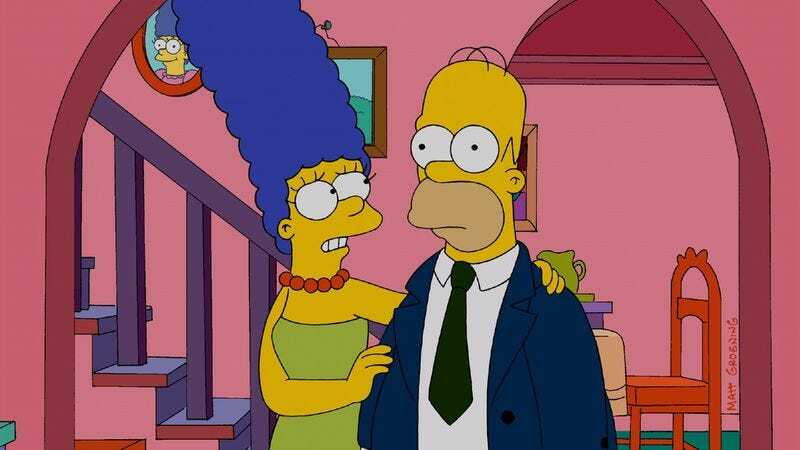 Here’s where the Homeland stuff really fails—given that they effect serious change in Homer (giving up beer and meat must be counted as impressive as getting Homer to stink-bomb a nuclear power plant), at least a cursory examination who who they are seems to be in order. Instead, um, one guy wears a funny hat. In the end, there are some funny lines, the gimmick doesn’t completely overwhelm the narrative, and things are back in place for the next episode. It’s not the worst omen for a new season of The Simpsons. I'm looking forward to it with guarded optimism and an open mind. Some effective direction on Lisa by Bob Anderson, with the movement and shadows as she spies on Homer heightening the tension. The re-imagined opening, with old instances of Simpsons violence edited into Homerland credits to ominous effect, exemplifies the pitfalls of theme episodes like this—it’s accurate, moderately clever, and not actually very funny. The joke where Homer unexpectedly whips out a snaggletoothed fish to fool Mr. Burns’ facial recognition software wouldn’t have been out of place in any great early episode.